This month marks the release of Unique Ink’s first book, the anthology Where the Roses Smell the Best. Unique Ink is special in that it is staffed by high school students in Roosevelt’s Writing and Publishing Center. The first launch reading took place at Powell’s on Hawthorne and the second at St. Johns Booksellers. Highlights of the first two readings included a poem of childhood reflection by Oregon Poet State Laureate Paulann Petersen and a funny vignette about the best way to die in Portland (on a bike) by writer Ana Matiella. Perhaps more engaging than the lush poetry and humorous prose was the very sight of the high school students taking time out of their summer vacations to crowd into cramped bookstore spaces to read, talk, and share their work. This was the opportunity for them to stand behind the book they had been tirelessly working on for the last year. It was during the Q&A sessions that they had the opportunity to speak about their experiences as student publishers. At the Powell’s launch, one Roosevelt High School student said she had considered herself someone standing in the shadows, but this book helped her to overcome her shyness. At the end of the reading, Paulann Petersen looked at Roosevelt student Zach with admiration and gave a bow to him when he talked about the importance of the program and of writing. The Poet State Laureate bowed to a high school student because she so strongly believed in his work! An audience member asked the adult readers how it felt to be published by students. Ana Matiella said she felt proud to work with the student publishers. Pamela Pfiffner said that she didn’t think of it in terms of age, but of people who shared a love of words. When I was a junior in high school, I dropped out of a creative writing class because it required that students read their pieces to the class on a weekly basis. I dropped my favorite subject because I was so terrified of public speaking. That’s what strikes me the most about these high school students–not that they show promise as writers, not even the astounding feat that they accomplished of publishing a book featuring prolific and well-respected writers like Brian Doyle, Kim Stafford, and Paulann Petersen. What strikes me about the Roosevelt High School students is their fearlessness. They are incredibly brave to stand in front of not only a crowd of adults (and audiences at readings aren’t necessarily the warmest group) but a crowd of their peers. To have the audacity to write. To have the audacity to publish. I envy these young and unabashed dreamers. I wish I had been as brave as them as a teenager. I hope the next generation is even braver. Wow this sounds incredible! Thanks for sharing. Thanks for reading! If you want to learn more about the program, check out their website. If you live in Portland, you can attend a reading. 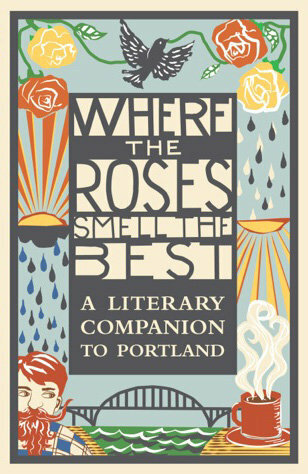 If you don’t live in Portland, you can buy the book online at powells.com. All proceeds support the program.